Camps are the great opportunity to get away from uni study and the pressures of life to spend time with others getting stuck into God’s Word. Bendigo Christian Union holds several camps across the year, often with groups from other campuses. To kick off the year it’s great to get away as a group to get to know each other a bit better and get stuck into God’s word together. Summit is our biggest annual CU camp, held in the middle of the year. 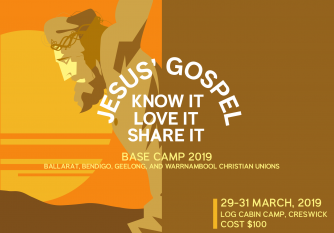 CU students from the country Victorian campuses of Bendigo, Ballarat and Geelong come together for a week of Bible talks, Bible studies, personal reflection, fellowship and fun. The boys have their infamous Blokes Camp which is the guys’ turn to hang out together, sleep in swags and do blokey stuff for a weekend. It’s a time of challenging talks and discussions, plenty of meat and good times. Girls Getaway is the annual day away for the girls at Christian Fellowship to hang out together and spend time in God’s word. Strategically placed after the UNMISSABLE NTE conference (and just before the Summer and Christmas holidays really kick in), the CU Summer Mission is a brilliant opportunity to take the gospel we proclaim on-campus off-campus and have a great time doing it! At the end of the year will be NTE. This is a huge conference with over 1600 students from Australia, all meeting in Canberra to hear talks, write talks, attend workshops and hear about missionaries from around the world. We then head off in mission teams and spread the gospel to towns and cities all around Australia.